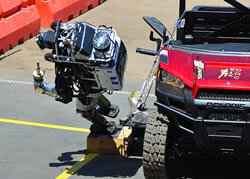 By Evan Ackerman for IEEE Spectrum: The best and worst part of the DARPA Robotics Challenge Finals waswatching all of those huge expensive humanoids topple over in a series of epic faceplants. Faceplants are called faceplants because you’re planting your face into the ground as a means of breaking your fall, which usually also breaks your face, among other things. This tends to happen when you’re unprepared for falling, which with most robots, is 100 percent of the time. Now researchers at Georgia Tech want to teach humanoid robots to fall more safely with techniques adapted from judo, which might protect them enough to actually be able to get up again.